HÀ NỘI — Alibaba group Chairman Jack Ma said yesterday that deep-seated hesitation among Vietnamese consumers could hamper mobile payment development in the country. Addressing the Vietnam Electronic Payment Forum 2017 (VEPF) in the capital city, the Chinese tycoon said the rate of cash transactions in Việt Nam was too high, despite the huge potential to develop e-commerce in the country, given its young and active population. He said people keeping cash in their wallets increases chances of cheating, corruption and pick-pocketing. If people don’t use wallets, the cutpurse will be jobless. Instead of using cash, consumers can use mobile phones equipped with anthropometric technology, Ma said, adding that such transactions would be safe and any fraud easy to detect. Deputy Prime Minister Vương Đình Huệ said at the forum that in the context of globalisation and integration, mobile payment was “an obvious trend”, and that “no one wants to be left behind”. It is a trend that can bring many benefits to the people, enterprises and the State, he said. Huệ said that implementing digital technology solutions has helped many countries in the world achieve breakthroughs in promoting financial inclusion, enabling people from all walks of life to access financial and banking services. “Digital technology helps remove spatial, time and geographic barriers, allowing credit institutions to offer products and services at a lower cost, and facilitating consumers’ access,” he said. Huệ said he agreed with the Alibaba Chairman that mobile payment would also improve transparency in economic activities. Việt Nam will soon see an explosion in mobile payment, he predicted, saying the Government supported and was strongly committed to creating favourable conditions for mobile payment development in Việt Nam. This would help, in part, to reach the target of reducing cash transactions to below 10 per cent by 2020, he said. According to the State Bank of Việt Nam (SBV)’s Payment Department, Việt Nam has good foundations to popularise the mobile payment method, thanks to easy availability of telecommunications services and the high rate of mobile phone use. So far, there are 130 million mobile phone subscriptions in Việt Nam, and 41.8 million of them use 3G to access the Internet. More than half the Vietnamese population uses smart phones, and the number is expected to increase to 80 million by 2020. The department also notes that there are 41 commercial banks nationwide offering mobile payment services and their transaction value has been increasing strongly. In the first nine months of this year, there were 90 million mobile payment transactions worth VNĐ423 trillion (US$18.8 billion), an increase of 93 per cent and 139 per cent, respectively, over 2016 figures. Huệ said that to address challenges in developing mobile payment, the Government will regularly hold dialogues with the business community as well as domestic and foreign financial institutions to figure out barriers and seek timely solutions. The Government will also complete a legal framework and build action programmes to promote e-commerce application in general and mobile payment services in particular, he said. The Deputy PM asked ministries and other agencies to study the possibility of e-payment application in informal economic sectors. These sectors need to be better managed to avoid tax losses, he said. SBV Deputy Governor Nguyễn Kim Anh said that the central bank has been encouraging commercial banks to apply advanced technologies in banking operations in general and payment activities in particular. This will expand consumers’ ability to access modern banking products and services, which will help improve the business efficiency and governance capacity of credit institutions, he said. Anh also said that the SBV has established a steering board of financial technology (Fintech) development to give the Government advice on legal frameworks and facilitate the operation of Fintech businesses. Cấn Văn Lực, director of training with the Bank for Investment and Development of Việt Nam, said that the Government needs to build a customer authentication infrastructure based on anthropometric data to support payment service providers in verifying customers’ information. HÀ NỘI — Prime Minister Nguyễn Xuân Phúc hosted a reception in Hà Nội on Monday for Jack Ma, Executive Chairman of the Chinese Alibaba Group, who is in Việt Nam to attend the Vietnam E-Payment Forum. 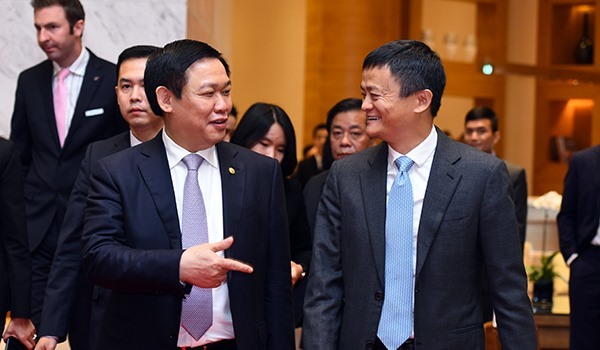 Jack Ma told the PM that his visit aims to study Việt Nam’s e-commerce situation, including co-operation opportunities with Vietnamese partners. He said the potential for e-commerce development in Việt Nam was huge as the country had a young and active population. He expressed his interest in Việt Nam’s five-year (2016-20) master plan for e-commerce development, which targets having 30 per cent of the population conducting e-commerce transactions by 2020. To achieve this goal, Jack Ma proposed policies that hasten non-cash payments, including e-payments with smart phones, as well as speeding up the processing of logistics service procedures. Acknowledging the guest’s proposals, PM Phúc asked the Ministry of Industry and Trade to consider them and boost co-operation with the Alibaba group. He asked Alibaba to open a Việt Nam store to introduce Vietnamese products to consumers in China, co-operate with Vietnamese partners in providing e-commerce training, and help micro-enterprises and people gain access to e-commerce. He said he hoped to receive assistance and investment from Jack Ma and the Alibaba Group for start-ups in Việt Nam.